Um Osama has been selling goods on the main path that leads to the Aqsa mosque in the Old City of Jerusalem, for the last 20 years. She managed to get herself a spot on the stairs under the house that Ariel Sharon, the former prime minister of Israel, bought in the heart of the Palestinian part of the Old City. A large Israeli flag flies each day over her head. Um Osama is harassed on a daily basis by Israeli police, soldiers and municipality inspectors who try to push her out of the Old City. Despite all the difficulties she has faced, for decades she has not moved from her corner. She struggles again and again and always comes back with her goods which include colourful women’s garments that she displays on the ground. Her clients are Palestinian women who are on their way to the Aqsa mosque. Those who argue with her over prices will not win. She is sharp and determined. “If you don’t like my prices, go to the Chinese industry … Since the Chinese started controlling the market here, it made it more difficult for us. Its bad quality, but it’s cheaper for the people. I had to reduce the prices. You see this ‘dishdasha’? I am selling the 12 pieces for 100 shekels [$24]. When Sharon entered the Aqsa Mosque in 2000 and the Second Intifada begin, the political situation grew worse and so did life for Um Osama. Since then, she has not been able to return to Gaza. Going back would mean that she would not be able to return to Jerusalem, where her livelihood is. She stayed in Jerusalem so she could help feed her eight adult children, their families and her grandchildren. In the last war on Gaza, in the summer of 2014, five of her close relatives, including women and children, were killed by the Israeli army and their families lost their home. Since then, the circle of family she supports has grown even larger. Um Osama has never meet her grandchildren. In 2008, I visited her family in Gaza and brought back pictures of each of her children. She did not recognise any of them: “They grew up very quickly,” she said. It has taken Um Osama about 20 years to establish her life in the Old City, to fight for her place within the many shops in the market and to struggle with the Israeli authorities who come every day to arrest those who they consider illegal. They have confiscated her goods hundreds of times. “I lost a lot of money, they come from the municipality and take everything I have,” she said. Um Osama never gives up, she always gets up and starts again. She has become part of the city. Other women sit near Um Osama. 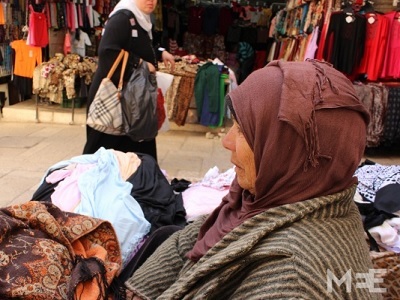 They come from the West Bank, from Hebron, Beit Lahm and Nablus and they also sell their goods on the Old City streets, facing the same risks of arrest and confiscation. They know each other’s stories well and look out for each other each day, leaving their goods with another if they must go, or warning a fellow seller if a municipality official is coming and they must pick up their things quickly and pretend to be visitors. Um Muhammed starts her day at 4:30am when it’s still dark. She takes a taxi from Yatta village to Hebron and from there to Beit Lahm and, from Beit Lahm, she takes the bus to Jerusalem. “Now that I am 67 years old the soldiers don’t pay attention to me. For many years, we had to sneak in through the back roads in the mountains and find ways to avoid the soldiers at the checkpoints. Sometimes we began our journey at 2:30 in the morning. The soldiers used to stop us and send us all the way back, but we didn’t go home. We knew of alternative ways. The Wall wasn’t complete at that time and we went around to avoid the checkpoint. It was hard and long. We sometimes arrived as late as 2.30pm. We spend 12 hours through back roads just to come here and work,” she said. “They don’t understand. The Israelis don’t understand that I have eight children and someone needs to feed them and buy them cloths and things for school. I will never accept donations from anyone. I just want to be allowed to feed my children and to give them a good education … I have been working for 20 years. Some of my children are married now and those who graduated from the university do not have jobs … When the soldiers at the checkpoint ask me where I am going, I say that I am going to pray in the Aqsa.” Tucked into her long Palestinian dress, she hides the cheese and the milk she will sell and makes her way into the Old City. After evening prayers, Um Muhammed collects her goods and starts her way back to Yatta. On good days, she arrives at around 8pm with an income of about $10. Near Um Muhammed and Um Osama is Maria, from the village of Artas near Beit Lahm, who has sold sage, mint and grape leaves in the Old City since 1989. She has not always had to be a vendor. “We had our land and we lived off it, but the Israelis confiscated the land and nothing was left for us,” she says. Artas is near the Israeli settlement of Efrata and has suffered for many years from land confiscation. Though some of the land remains in the hands of its original owners, with fruit trees, many properties were sabotaged, with trees uprooted – or growing forbidden – for the sake of development of the nearby settlement. Maria continued: “We were self-sufficient and we worked our land. We didn’t need any favours. We wanted to be left alone.” Like Um Muhammed, Maria leaves her house at 3am or 4am with other Palestinian women in search of a better life. Those who are stopped by soldiers make their way through the mountains. “They know that we will manage to get in; they don’t want us to enter Jerusalem in a respectful way. They want us to feel like thieves,” she says. Israeli officials consider the Palestinian women who come from the West Bank as illegal workers and so they live with the constant risk of being arrested and fear that their goods will be confiscated.